CH-EQ2B, Software parametric EQ from linuxDSP. linuxDSP has announced the release a Windows VST version of CH-EQ2B, a parametric equalizer effect plugin. The new linuxDSP OverTone range of plugins are ports of selected plugins to Windows XP / 7 and other operating systems. 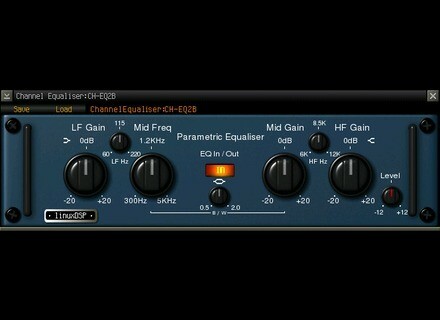 The first of these is the CH-EQ2B Channel / Master parametric EQ. The CH-EQ2B uses DSP technology to provide filters with an analogue style frequency response without resorting to CPU intensive upsampling, according to the company. CH-EQ2B is available to purchase for £20 GBP. The activation key will also be valid for the linux versions of the plugin. Steinberg Cubase 6 Elements for Trial Cubase Elements 6, the smallest retail version of Steinberg's Cubase music production software, is now available as a free trial version for download. Bluezone Ambient Injection: Evolving Energy Bluezone Corporation has released Ambient Injection: Evolving Energy, a sample library featuring sounds for Sci-Fi film scoring. Wizdom Music SampleWiz for iOS Jordan Rudess’ Wizdom Music has released SampleWiz, a sampler music app for iOS.